Dr. Shashi Tharoor is an accomplished Author, a reputed United Nations peace-keeper, a reliable refugee worker, and a renowned human rights activist. He is also a Minister of State for Human Resources Development. He was elected to the Indian Parliament from the Thiruvananthapuram constituency in Kerala. When he became a member of parliament, he was made Minister of State for External Affairs. He had to relinquish the job of a minister due to IPL team Kerala Tuskers controversy. Before entering into the national politics, Dr. Shashi Tharoor was straddled several world affairs. He is an orator who can converse well in English, French, Malayalam and Hindi languages. Dr. Shashi Tharoor was born as a member of Tharoor Tharavadu in the year 1956. However, he was born in London to a Malayali couple Chandran Tharoor and Lily Tharoor. After his parents returned to India, he was enrolled in Montfort School at Yeracaud in the state of Tamil Nadu. Later, he had his secondary education from a reputed Champion School in Mumbai. He completed his higher secondary education and PUC from St. Xaviers' Collegiate School in Kolkota. Later, he obtained a Bachelor's degree in History from St. Stephen's College in Delhi. He got married to Ms. Sundanda Pushkar, a successful business woman settled abroad. However, the marriage did not sustain long. Recently, Sundanda was found dead in a Delhi-based hotel. Since she died mysteriously, a case was ordered to probe into the circumstances that lead to her death. The case is under the investigation of Delhi Police. After getting his degree, young Shashi Tharoor went aboard to pursue his postgraduate course in law from The Fletcher School of Law and Diplomacy. From the same educational institution at Tufts University, Dr. Tharoor obtained M.A. degree, MALD in 1977, and a PhD in 1979. At the University level, he had received the Robert B. Stewart Prize for Best Student. During his eventful years at Fletcher School of Law and Diplomacy, he established a students' journal titled the Fletcher Forum of International Affairs. Dr. Tharoor was its first editor. This journal is running successfully even now at the University premises. Other degrees conferred on him include an honorary D.Litt. from the University of Puget Sound and a doctorate degree, Honoris Causa, in History from the University of Bucharest. Dr. Tharoor began to work at the United Nations (UN) when he was doing his doctorate degree from Fletcher School of Law and Diplomacy in 1978. His initial appoint was as a junior staff at the office of the United Nations High Commissioner for Refugees (UNHCR) in Geneva. In that profile, he was responsible for post cold war peacekeeping activities. From 1981 to 1984, he independently handled the UNHCR office at Singapore. During this period of time, he efficiently handled the office during boat crisis over there. In recognition for his good job, the office of UNHCR appointed him as the Special Assistant to Under Secretary General for Special Political Affairs. This unit later on became the nodal point for Peacekeeping Operations in New York. While working with this nodal agency, he independently guided the agency to successfully handle peacekeeping operations in former Yugoslavia. Dr. Shashi Tharoor was appointed as appointed as the Director of Communications and Special Projects in 1996. In the same year, he was also appointed as the Executive Assistant to the then Secretary General Kofi Annan in recognition of his selfless and sincere services. For about five years, he could do some commendable job in his new profiles and earned the accolades of the Secretary General Kofi Annan. As a result of his good work track record, he was made the Under Secretary General for Communication and Public Information. During his tenure at the Department of Publication, he brought some landmark reforms to make the department current and revamp the image and effectiveness of the UN at the international fora. His tenure at the department also witnessed a number of initiatives that range from organizing and conducting the first-ever UN Seminar on anti-Semitism, a seminar on Islamophobia to launching of the annual list of Under Reported Stories that the World Should Know. In recognition for his service at the UN-level, the Government of India nominated him for the post of Secretary General in 2006. However, his ambition to become Secretary General of United Nations did not get fulfilled. As a result of this, he left his illustrious career in the United Nations when he resigned the post of Under Secretary General on April 1, 2007. Dr. Shashi Tharoor has successfully authored about fourteen books, op-Eds, hundreds of articles and book reviews in a large number of publications. This includes the New York Times, Newsweek, Washington Post, Time, International Herald Tribune, Los Angeles Times and The Times of India. He was also a Contributing Editor and occasional Columnist for Newsweek International for two years. After getting the gist of what is happening at the national level, he began a fortnightly column in The Asian Age, Deccan Chronicle and Mail Today. For Project Syndicate, he has written an internationally syndicated monthly column. Continuing his literary adventure in the field of journalism, he has written regular columns for the Indian Express, The Hindu and The Times of India at various points in time. Dr. Shashi Tharoor has written about 8 non-fiction books. They are Reasons of State, From Midnight to Millennium, Kerala: God's Own Country, Nehru - The Invention of India, The Elephant and The Tiger, Bookless in Baghdad and the Cellphone - Reflections on India in the 21st Century. In the field of sports, he has written an article on India-Pakistan cricket. This article is titled Shadows Across the Playing Field. This article was co-authored by him with another person by the name Shaharyar Khan. Another one written by him was doing a case study on India's foreign relations and global strategy. The title of the work was Pax Indica: India and the World of 21st Century. Dr. Shashi Tharror has written three novels. They are The Great Indian Novel, Riot, and Show Business. He has to his credit a collection of short stories. It is titled The Five-Dollar Smile. Another literary creation of Dr. Tharoor was the text of a coffee-table book with the photographer. This book is titled Ferrante Ferranti, India (2008). Many of his books have been translated into French, Malayalam, German, Marathi, Italian, Russian, Polish, Romanian, and Spanish. Each of his books has been a best seller in India. For example, The Great Indian Novel has gone many editions. It is currently in the 28th edition in the country. Another book titled The Elephant and The Tiger has undergone several hardcopy re-printings in the country. 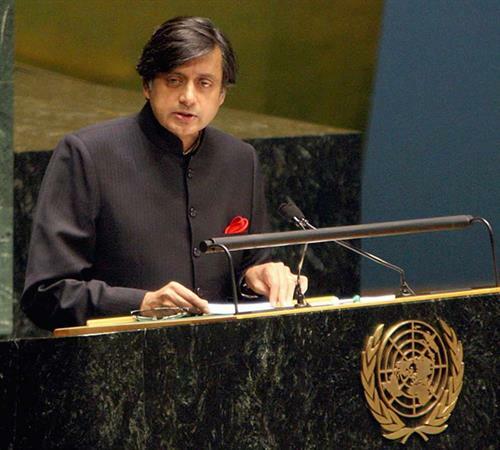 After his tenure at the United Nations, Shashi Tharoor came back to India and started participating in various cultural events happening throughout the country. Many of his works at the national level was taken not of by the think tanks of Indian National Congress. As a result, he was formally invited to join the Congress party, which he readily accepted. Riding on his popularity amongst the learned youth of the country, the election committee of the Indian National Congress decided to give him a ticket to fight in the General Elections from Thiruvananthapuram Lokh Sabha Constituency. In the ensuing election of the year 2009, he successfully fought the general election and became the Member of Parliament representing the capital city of the state of Kerala. Subsequently, Dr. Shashi Tharoor was appointed as the Minster of State for External Affairs. After a period of one year, he had to relinquish his membership in the Council of Ministers at the center due to his alleged association with the IPL team Kerala Tusker. After this, he became the Member-Convener of the Parliamentary Forum on Disaster Management. Looking at his good work, he was also made a member of the Standing Committee on External Affairs, the Public Accounts Committee, the Consultative Committee on Defense, and the Joint Parliamentary Committee on Telecoms. As a learned person on various topics, he has participated prominently in many of the important debates during his tenure as a Lokh Sabha Member. It includes debates on the Lokpal Bill, demand for grants to the Ministry of External Affairs, the motion of thanks on the President's Address, the demand for grants to the Ministry of Commerce and Industry, copyright rules, black money, and the commemoration of the 60th Anniversary of Parliament. Dr. Shashi Tharoor is a recipient of several awards for his contribution to various fields in public life. In January 1998, World Economic Forum based in Davos, Switzerland, conferred on him the title of Global Leader of Tomorrow. The other awards received by him include a Commonwealth Writers' Prize, the Pravasi Bharatiya Samman, the Pride of India Award, the Hakim Khan Sur Award for National Integration, NDTV's New Age Politician of the Year Award, GQ's Inspiration of the Year Award, and Distinguished Global Thinker Award given by IILM. He was also named the Digital Person of the Year at the Indian Digital Media Awards in the year 2010. He was fortunate enough to get the award titled the Encomienda de la Real Orden Espanola de Carlos III from the hands of King of Spain. Dr. Shashi Tharoor is another emerging star in the political landscape of the country. He began his journey in his professional life by taking various appointments at the United Nations. At the United Nations, he started from the humble beginning to become the Under Secretary General. In various capacities, he performed his job well and brought in some landmark reforms to bring more brand value for the United Nations across the globe. Apart from his diplomatic credentials, he has sparkled like a star in the literary and journalistic fields. Many of his books and articles have turned out to be best sellers across the country. He has also written 3 nonfiction books that turned out to be the best amongst the elite and learned members of the society. Looking at the career credentials at the United Nations and stature as a literary person, he was nominated by the Government of India for the post of Secretary General. However, he could cut the ice in the contest. Recently, he incurred a personal loss when his wife Ms. Sunanda Pushkar died mysteriously in a hotel room in Delhi. She was his third wife.